Hours: The South Texas Gardens is open daily from 8am – 6pm. Summer hours start May 1st through Labor Day 8am – 7pm. This is a paid admission public garden. 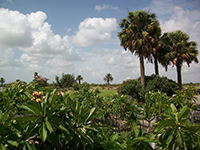 The Gardens are one of the largest attractions in the Corpus Christi area, and a major tourist destination in Southern Texas. Gardeners and hobbyists from all over the region and the country come to the South Texas Botanical Gardens to view the exhibits, get garden designs for their own gardens, as well as the peace and serenity the many gardens and displays have to offer. The Gardens first opened in 1987 with a small cottage garden that covered one acre, a small information center located in a farmhouse, and a single nature trail. This setup served visitors until 1996 when the South Texas Botanical Gardens officially moved to its current one hundred and eighty acre location along the Oso Creek on the south side of Corpus Christi. In 2009 the Gardens opened the Butterfly House and the Bromeliad Conservatory to the public. Both exhibits are part of an ongoing capital investment in the grounds that will eventually lead to an educational facility, visitor’s center, a play area for children, and dancing water features. The Gardens are considered an integral part of the growing greenbelt system along Corpus Christi’s Oso Creek. 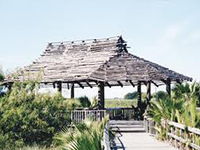 The grounds are located on the coastal Texas birding trail and are a wildlife program site where visitors can come watch the beauty of nature. 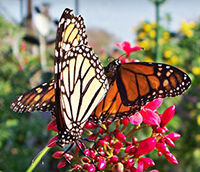 The South Texas Gardens run year long educational environmental and horticultural workshops and classes for children, various seasonal camps, as well as adults. Several sites on the grounds are made available for rent for weddings, birthday parties, and other social events. The South Texas Gardens are a hub of environmental and horticultural education and conservation that actively benefits the residents and the economy of Southern Texas and the Coastal Bend way of life. 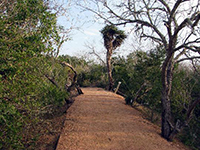 The Gardens are a vast source of education for visitors and residents in the area of environmental conservation. Anderson Bromeliad Conservatory: Opened in the spring of 2009, this conservatory is a state of the art facility that is home to over eight hundred bromeliads that were collected from regions around the world by internationally renowned bromeliad collectors, Nelwyn and John Anderson. Rose Garden: The stately rose garden at the South Texas Botanical Gardens displays twelve different raised planting beds that contain over three hundred specimens of roses. This garden is a popular favorite for local weddings with its expansive fountain and long brick walkway that has come to be known as Bridal Path. A spacious pavilion offers a scenic view the entire garden and is ideal for the wedding ceremony. Plumeria Garden: The Plumeria Garden is one of the largest of its kind in the continental US with over one hundred tropical varieties in its collection. Plumeria are native to the Caribbean region, so they have to be greenhoused during the dormant winter months so that they are protected from the occasional freezing temperatures in the south Texas region. Sensory Garden: This area of the South Texas Gardens is designed and landscaped to stimulate all five senses. The unique sculptures and stunning plants are sure to impress any visitor. Hummingbird Garden: This garden helps local Texans learn how to design and build hummingbird attracting landscapes in their personal gardens. The demonstration gardens are used to test and select plants that prove to be the hardiest, and the most disease and pest resistant. Orchid Greenhouse: This two thousand plus collections is one of the largest and most admired in all of the Southwest. The collection features many popular species such as dendrobium, paphiopedium, phaleonopsis, and cattleya that provide blooms almost the entire year long. Butterfly House: This relatively new exhibit in the South Texas Gardens features large masses of larval and nectar plants to attract butterflies. In 2009 the Gardens constructed an octagon shaped screened in structure that serves as an interactive butterfly exhibit where visitors can walk through and view butterflies that are native to the region, as well as migratory ones. Among the butterflies housed in this exhibit, you will find Buckeye, Zebra Longwing, White Peacock, Queens, Monarchs, Red Admirals, Giant Swallowtails, Tiger, and Gulf Fritillaries. This twenty size hundred square foot exhibit is sure to impress anyone who walks through it.